Angry Birds Rio is available on the App Store for free for a limited time. In this game, the original Angry Birds are kidnapped and taken to the magical city of Rio de Janeiro, where they escape their captors and go in search of his friends Blue and Jewel, two macaws stars of the film, to save them. 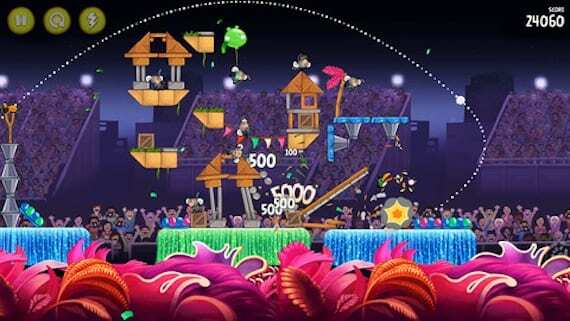 Angry Birds Rio joins the game based on the physics of the original title with incredible twists based on the film. A month ago I informed the update that got this game Rovio guys, and now have decided to offer it for free so grateful million users throughout the world. Six fantastic episodes with 180 exciting levels plus 24 new bonus levels. Use your skills in Angry Birds in the ultimate test against bosses and spectacular. Compatible with iPhone 3GS, iPhone 4, iPhone 4S, iPhone 5, iPod touch (third generation), iPod touch (fourth generation), iPod touch (5th generation) and iPad. Requires iOS 4.3 or later. This app is optimized for iPhone 5. Take advantage of this promotion of this fantastic saga of Angry Birds, hurry because this limited time for free and return to its price of 0.89 €. You can download the application on your device from the App Store by clicking the link below. Article Angry Birds Rio for iPhone free for a limited time has been originally published in News iPhone .